Holly Holm was big enough to take her loss against Germaine de Randamie like a pro, showing up at the press conference, answering tough questions, and trying to make sense of it after UFC 208. Still, a little reflection on what transpired at the Barclays Center fueled the fire for a rematch. The late punches after the second and third rounds that de Randamie landed fueled an official appeal to the New York State Athletic Commission. And Holm’s competitive spirit fueled her own reluctance to give in to easy excuses. “I know a lot of people say I won the fight clear, regardless of the late hits and all this, but I don’t really want a victory like that,” Holm said during an appearance on Monday’s edition of The MMA Hour. “I don’t necessarily want it overturned to like a win, but I definitely want to get a rematch. Hopefully the appeal will help with that. Just a few weeks removed from suffering her third straight loss, Holm says she is pushing forward with life, and trying to get her bearings again. She just returned from a trip to Peru, and said she’s trying not to let what happened in Brooklyn dictate her own general happiness. Still, the loss gnaws at her when she gets to thinking about it. From the lack of execution on her own end, to the late punches that she believes were intentional. Her appeal to the New York commission was denied, but she hopes it will lead to a rematch with de Randamie, who has publicly said she would welcome a second fight with Holm ahead of a showdown with Cristiane Justino. “I want to be able to feel I have the opportunity to move forward. Like I said, I wouldn’t want to have a victory that way. To me, that’s not like a real victory. I would just love to have the opportunity to do it again,” Holm said. The 35-year-old Holm said she hasn’t backed off the idea that de Randamie delivered the hard blows after the horn on purpose. The first time, between the second and third rounds, she says she was “rocked” pretty good. Holm was cautious not to let herself off the hook for her part in the fight, or to come off like she was complaining. “I’m not trying to be like a wuss about it and whine,” she said. “That’s definitely not what I’m trying to do. I think that’s a hard spot for me. A lot of people keep saying, well, she hit you after the bell, how do you feel? Well, I’m a fighter. I’m not going to sit here and whine about it and complain. There’s a lot of things I could have done. Since defeating Ronda Rousey for the women’s bantamweight title at UFC 193 in Nov. 2015, it’s been a hard stretch for the former boxing champion Holm. She lost her title against Miesha Tate at UFC 196 last March, and then showed up flat in her rebound fight against Valentina Shevchenko at UFC on FOX in July. The move up to featherweight to fight for the inaugural belt in that weight class was a chance for her to make history. Yet she came up short in a fight that will forever carry asterisks, which she admits is hard to swallow. 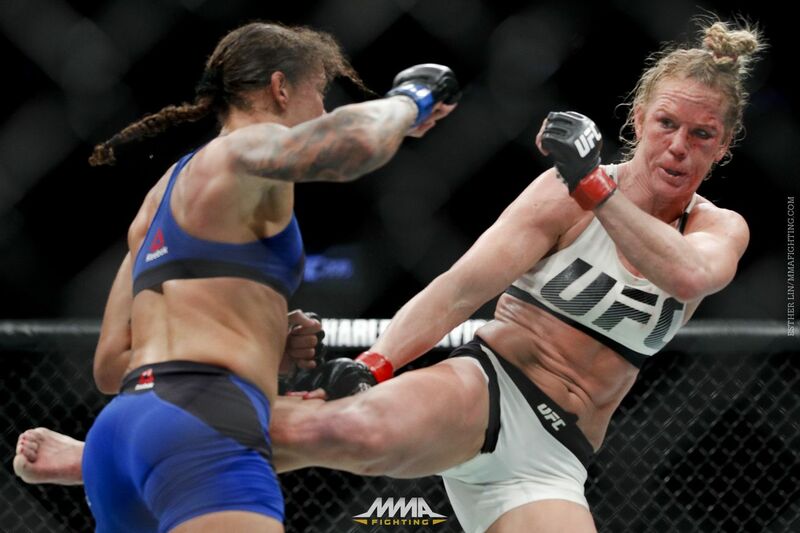 Asked if she still enjoyed fighting, with the initial highs and the recent string of lows, Holm said she did. “Yes, I love it,” she said. “Right now there’s a big hole in my heart. There’s an ache in my heart, having two losses that hole just got bigger. I’m not saying it doesn’t bother me. I think a lot of people, they see me still wanting to live my life and still wanting to push forward and wonder how I really feel. Holm said it’s a delicate thing when dealing with losses, because she has to contend with wondering how long she wants to continue fighting, and hear concerns about the ticking of the biological clock. “I do sometimes have to separate myself from the people that don’t do that,” she said. “From the people that think I should be retiring and having babies and all that kind of stuff. I don’t even like to really listen to it, because that’s not where my passion’s at right now or where my mind’s at. So everybody else that’s out there saying, oh you’re 35, what do you really want to do? Well I’m still fighting, and that’s what I want to do, and I want to surround myself with the people that are supportive of my passion.